Family, friends, parties, decorations, food. Christmas can be a wonderful time of year. However, many of the same things that make the holiday season an enjoyable time for humans, make it a dangerous time for household pets and larger animals such as horses. To assist people in protecting their pets during the holidays, the Humane Society of Canada has put together a list of some common holiday hazards that people should be made aware of. Festive items not on this list should also be evaluated for any potential risk. “In this situation, take the precautionary, ‘better safe than sorry’ approach,” says Michael O’Sullivan, HSC Executive Director whose family includes young children and several dogs and cats. Christmas Tree: Problems can occur when pets have access to the Christmas tree. Cats may want to climb the tree while dogs may knock it over. It is a good idea to safely secure the tree at the top and bottom. If your tree is real, don’t allow animal companions to drink from the tree reservoir and don’t use tree preservatives in the water. Evergreen needles that have fallen from the tree should be immediately cleaned up, as they can be harmful if ingested. Decorations: Glass ornaments, which can shatter into tiny, sharp pieces, should be avoided wherever there are pets. Tinsel and ribbon, which can cause gastrointestinal blockages, should also be avoided. Avoid using food decorations, such as popcorn garlands – the string is a choking hazard, and the tree might be knocked over. Liquid, bubbling lights shouldn’t be used, as the liquid is a harmful chemical. Electrical Cords, Fire, and Candles: Electrical cords can harm animals or cause fires. Electrical cords and wires should be inaccessible to pets. Consider using extension cords that can shut off the flow of electricity when a fire hazard is detected. A fire in the hearth or woodstove, and lit candles make for a cozy atmosphere, especially around Christmas; however, it is important to take the necessary precautions to ensure that pets are not hurt by fire or accidentally start one. Candles should never be left unattended; pets can easily knock them over. Fireplaces should have screens or doors that fit snugly, and minimize the risk of shooting embers. Food: Many people indulge in rich and sweet foods at Christmas. Unfortunately, some pets are also given human food treats that can be harmful, and even fatal, to animals. Candies can make pets sick. Chocolate and onions are toxic to animals and must be off limits to pets. Bones, particularly chicken and turkey bones that are brittle and can splinter and lodge in an animal’s throat or intestine, must be avoided. Toxic Plants: There are numerous kinds of plants that are associated with Christmas and which are also harmful to animals. The toxicity varies with each type of plant; some have a low toxicity while others are very toxic and can result in death. Avoid plants that can harm pets. Some common festive plants that are toxic are listed below. For more information on plants that are harmful to animals check with your veterinarian, search the Internet and/or contact The Humane Society of Canada at 1-800-641-KIND (5463). Christmas is a wonderful time of year. By knowing many of the festive hazards that our pets are exposed to, and being on the lookout for others, we can ensure that our pets will also have a safe and happy holiday! The Humane Society of Canada works to protect dogs, cats, rabbits and other small animals, horses, birds, livestock, lab animals, wildlife and the environment. They carry out hands on programs to help animals and nature, mount rescue operations, expose cruelty through hard hitting undercover investigations, work to pass laws to protect animals, use a multidisciplinary approach, support animal shelters and wildlife rehabilitation centres and spread the word about how to help animals and nature through humane education. A registered charity, The Humane Society of Canada depends entirely on donations to support our programs to help animals and the environment. 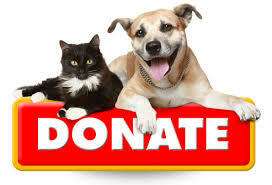 All donations are gratefully acknowledged with a receipt for income tax purposes. If you would like to support our campaign to protect animals and the earth, please make a donation here. Because when it comes to fighting cruelty, we don’t give up. Ever.